Now you can add one more ingredient to the list: a dangerous, highly toxic cocktail of chemicals that are being injected daily into thousands of acres of California farmland. 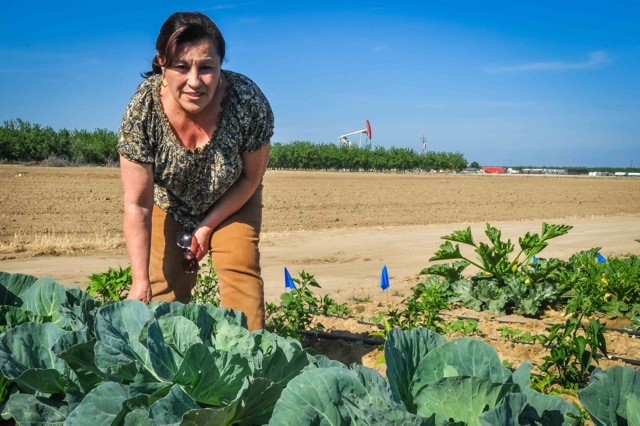 As part of the extreme energy process known as fracking, big oil companies are shooting dozens of hazardous chemicals into America’s most productive farmland, the San Joaquin Valley in central California. Increasingly employed by companies like Chevron and Occidental Petroleum, hydraulic fracturing (aka fracking) involves drilling a deep well into the earth and injecting millions of gallons of toxic fluid — a mix of water, sand, and harsh chemicals — at a high enough pressure to splinter the rock and release oil or natural gas. While other U.S. regions mostly frack for gas, here in California all fracking is for oil extraction. And in the San Joaquin Valley, where almost 50% of the country’s fruits and vegetables are grown, they are pumping those chemicals into the same farmland where I get my tomatoes, grapes, and yes, that avocado I put on my burger. It gives a whole new meaning to the phrase California cuisine. And yet Jerry Brown, Mr. Green Governor himself, supports fracking. Ignoring the destructive impacts on public health, air and water quality, and even civil rights, Brown continues to side with the oil industry in their fracking misadventures. Whether California — and states across the U.S. — continue down this dirty road or instead shift towards a brighter, cleaner path will be one of the big political battles of 2015. 1. It’s Called a Drought. My East Coast family will hate me for this, but do you know what our biggest weather problem in California is? Too much sunshine. We are currently suffering the worst drought in 1,200 years. It’s so bad that some towns in the Central Valley have literally run out of water. Given this severe shortage, you’d think the overly wasteful, water-intensive fracking process (over 160,000 gallons of fresh water per oil well) would come under more scrutiny. But no, this is frack-happy California! Drill, baby, drill! Meanwhile, the contaminated water seeps into local wells that people use for drinking, cooking, and showering. And down in Kern County, I saw a new problem that is likely unique to California: a polluted aqueduct where oil companies sell barely diluted fracking wastewater to nearby farms for irrigation. The farms, already suffering water shortages from the drought, see no choice but to buy this dirty water to irrigate their (decidedly not organic) grapes and lettuce. So the fracking industry isn’t just exacerbating the drought — they’re profiting off of it. 2. Cancer and Asthma Shouldn’t Come this Young. In Shafter, CA, I stood on the playground of Sequoia Elementary School, surrounded by 3 active fracking wells within a couple hundred yards. While kids play basketball, a nearby methane flare shot noxious, bright orange flames high into the sky. I listened to community members tell us of students in class coming down with inexplicable headaches and nosebleeds. Every other kid has an asthma inhaler. A 9-year-old boy mysteriously has prostate cancer. This is the most painful part of the tour. Kern County has had serious environmental health problems for decades, but fracking is turning those problems into a crisis. And it’s hitting children the hardest. 3. Environmental Racism is Still Racism. There are no fracking wells in Beverly Hills. Why not? They have oil. The other thing they have, though, is lots of rich white people. The small towns of Kern County, on the other hand, are primarily working-class Latino communities. Home to farmworkers, teachers, and truck drivers, Kern County and the Central Valley have long been the dumping ground for California’s pollution. Just down the road in Delano is where Cesar Chavez led his final hunger strike to protest the use of dangerous pesticides, which were causing cancer and health problems for the Latino farmworkers. Now these same Latino communities are on the frontlines of the fracking crisis, once again leading the fight for equal rights and a healthy environment. The media keeps telling us that racism is dead, but when it comes to ecological justice, life in California is still separate and unequal. 4. More Earthquakes? For Real?? If there’s one thing that unites all Californians, regardless of race, class, or your opinion of the Lakers, it is our fear of earthquakes. From San Francisco to Los Angeles, we all tremble in anticipation of the next Big One. So the idea that we would encourage a process that literally blasts holes in our state’s geologic backbone seems like a Hollywood disaster movie waiting to happen. The correlation is strong. States like Texas and Oklahoma, home to hundreds of fracking sites, are now more earthquake-prone than California. Oklahoma! If fracking is messing with the earth in the flat plains of Oklahoma, who knows what it will do to the volatile seismic landscape of California? 5. Climate Change Is More Than a Catchphrase. Temperatures are rising. Oceans are rising. We have more hurricanes, more mega-typhoons, and yes, more drought. Climate chaos is a nasty beast, and fracking is only going to make it nastier. In addition to releasing massive amounts of carbon into the air, the fracking process burns huge quantities of methane, which is at least 20 times worse of a greenhouse gas than carbon. Governor Brown acknowledges that climate change is real, but then promotes policies like fracking that make it worse. That’s like telling someone who’s just been shot, “Your wound is real. I believe you that it hurts. Now let me stab you a few hundred times.” It’s pretty simple, Jerry: keep the oil in the soil. 6. You Want Alternatives? Just Look Up. It’s called the sun. We have a lot of it in California. I’m just saying. 7. New York Banned Fracking. We Can’t Let Them Show Us Up! This is where it gets personal. My brother lives in New York, I live in Oakland. He’s a Biggie fan, I’m 2Pac. So last month when New York because the largest state to ban fracking, my brother called me up to rub it in. I love my brother, but if there’s one more thing that unites Californians, it’s our hate for arrogant New Yorkers who think they’re better than us. So let’s do this, West Coast! We need to step our game up. Let’s ban fracking…and put solar panels on every house in the barrios of Kern County! Let’s put a tax on carbon pollution…and reinvest those funds in green-collar worker co-ops from Richmond to Fresno! Let’s stop pretending that driving your Prius is enough for the environment…and understand that real climate leadership comes from the people who have to take the bus. 8. Remember that California Burger? When it comes to California, back the frack off.